Nationalizing the land and banks, rumored ties to German intelligence – the Bolshevik leader Vladimir Lenin has sat down with the Russian Telegraph to discuss some of the burning issues in 1917 Russia. The monarchy has fallen, the royal family is under arrest, WWI is raging, and Lenin has recently returned to Russia from his long-term exile in Switzerland to join the Revolution. From his political emigration he brings radical ideas about the direction in which Russia should move. 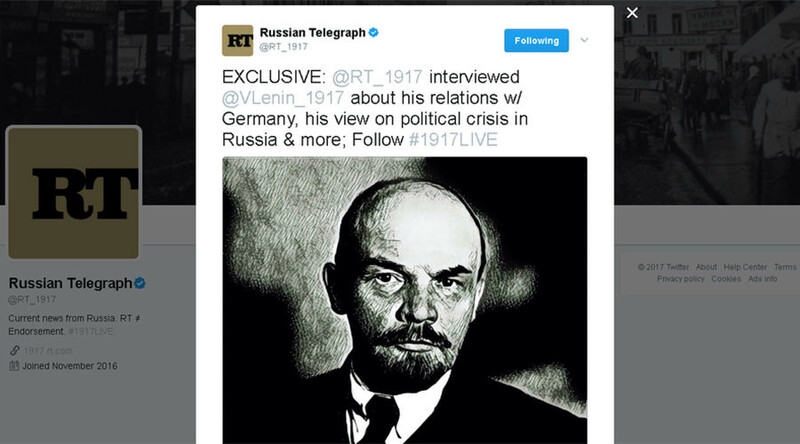 The Russian Telegraph (RT) is a fictional media outlet, part of the #1917LIVE project, which relives the momentous events of the Russian Revolution through the eyes of its main actors and witnesses. RT managed to talk the Bolshevik leader who has been busy galvanizing crowds in Petrograd (St. Petersburg) with populist slogans and bold speeches since his arrival on April 16, 1917. Lenin believes that the February Revolution that ousted Tsar Nicholas II more than a month ago, was bourgeois in its nature and more should be done to topple the rule of the exploiting classes. He has a clear and simple ideas how to deal with economy – and many among the common folk find these appealing. Lenin loathes the Provisional Government, which he says represents the capitalists and is rallying against it. “All power to the Soviets!” – he exclaims referring to its rival authority, the Petrograd Soviet of Workers' and Soldiers' Deputies. Lenin returned to Petrograd from Zurich through the territory of hostile Germany – Russia’s enemy in WWI. He managed to strike a deal with the Germans, allowing him and his fellow Bolsheviks safe passage in a “sealed” train car. This controversial decision sparked speculation that Lenin was a German spy or that he was receiving money from Berlin. A firebrand revolutionary, Lenin is gaining momentum, but nobody has yet realized that this short, simple-looking man will soon forever change Russia and impact world history.